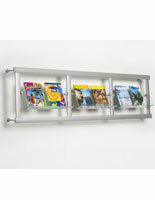 What are the benefits of choosing metal magazine racks over wooden ones? 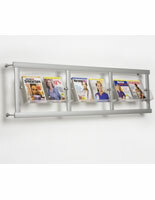 These wall mounting fixtures store business periodicals neatly without taking up floor or counter space. 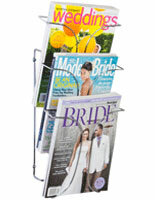 Buy wire magazine racks with pockets, also known as catalog holders, instead of wooden ones to save on cost without sacrificing style! 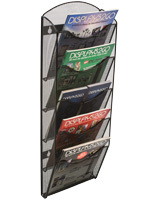 Each of these durable hanging stands will withstand use for years to come. 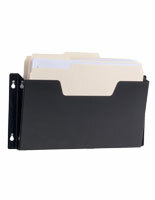 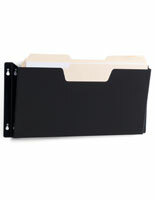 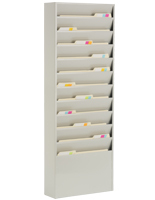 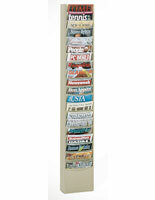 The tiered holders are vertical displays that provide ample storage for standard sized publications. 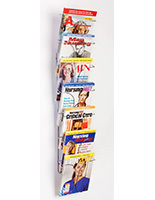 Some models have a poster attachment for advertising your business and brand. 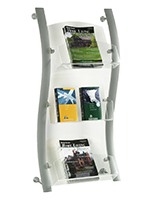 These supports for brochure or catalog collections come in an array of shapes, colors, and sizes, and a few models have an eye-catching curved design. 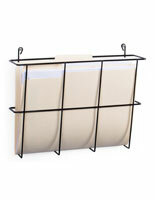 These displays for wall mounting are affordable, great looking alternatives to hardwood fixtures! 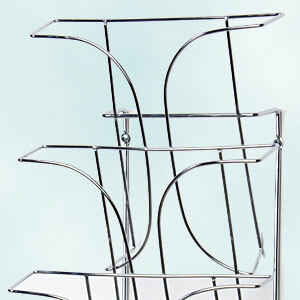 What are some special features of these affordable wire magazine racks? 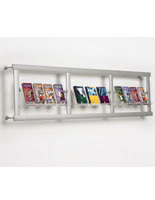 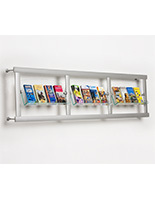 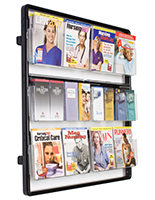 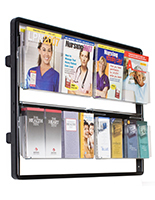 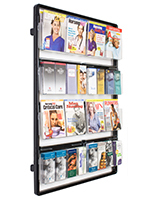 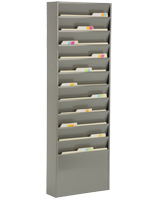 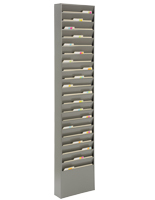 These metal magazine racks come tiered with steel construction and multiple pockets for dispensing literature of all sizes. 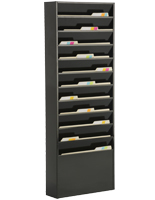 Some of the storage units in black and putty have Con-Tur design, which eliminates publication “paper curl” to keep publications neat. 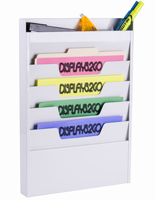 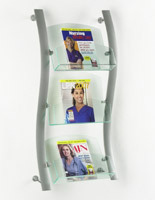 Horizontal displays have two poster mounts on either side of an acrylic brochure holder with green edging that is less expensive than glass. 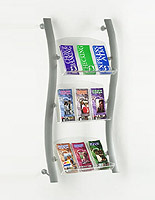 Vertical silver aluminum fixtures with green-edge acrylic pockets have an “S” shape for visual appeal, & a poster mount. 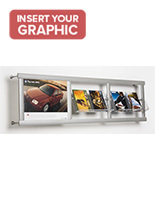 These holders for a magazine come in brushed aluminum styles with acrylic panels sized for trifolds and catalogs (or a combo of both) & are set off the wall. 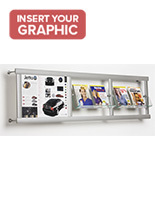 Chrome wire constructed rackage is affordable, with a cool, open design for full views of the contents to draw customers in. 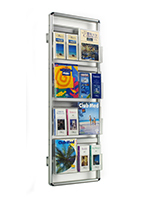 These hanging showcase systems offer professionals an affordable and attractive way to dispense promotional literature to prospective clients, or reading material for their entertainment while they wait for service. 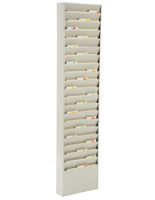 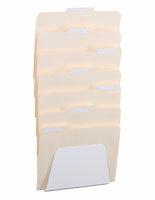 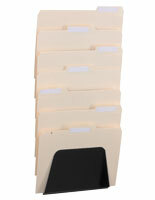 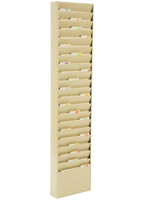 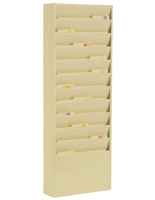 This storage system has a variety of designs and pocket numbers (6, 10, 11, 12, 18, etc.) 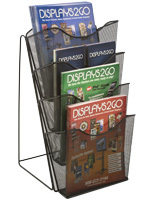 configured for storing trifolds, newsletters, and some wire magazine displays come with poster attachments! 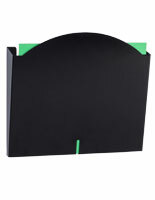 Some wall mounting models stick out from the wall 7” have acrylic green-edged trays sized for a brochure collection. 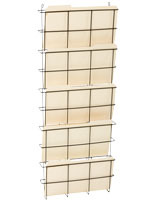 Pegs turn some 24-pocket unit into a 12-pocket display! 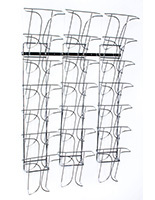 Each of these racks can hold standard materials of many sizes in one unit. 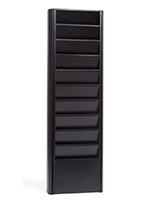 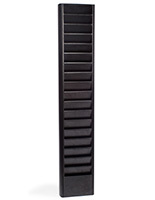 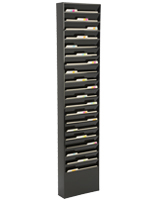 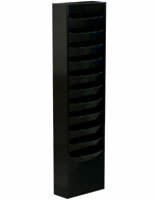 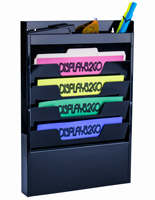 These racks come in black, putty, or brushed aluminum finishes to blend with any corporate décor or retail store theme. 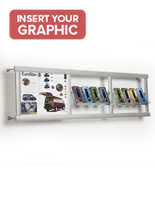 Some hanging racks include clips for headers to announce what the presentation materials underneath are, or reinforce company brand. 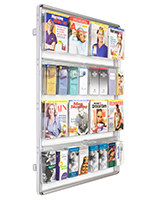 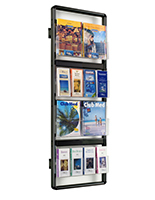 Within our prestigious line of rack systems for periodicals are chrome wire supplies priced to sell, and hold and dispense promotional pamphlets on the wall. 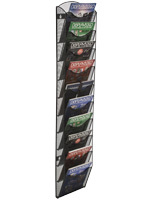 These hanging stands with multiple brochure pockets when in stock can be same-day shipped, which makes them a favorite of busy professionals and corporate office designers! 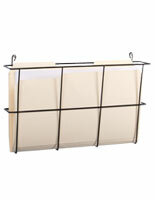 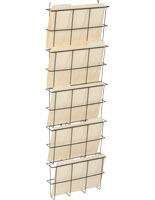 Buy wall mounting holders with varied divider sizes for the storage of catalogs and trifolds at the same time! 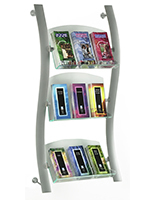 Each of these hanging stands, also known as metal magazine displays, can be purchased in bulk for malls, libraries, or other chain stores at a huge savings to the buyer! 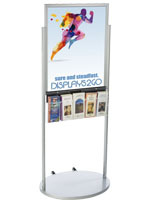 Boost sales of merchandise or services, reinforce brand and messaging, and make any business venue beautiful, for cheap with these supplies!